Signi?cant progress has been made in the development of neural prostheses for restoration of human functions and improvement of the quality of life. Biomedical engineers and neuroscientists around the world are working to improve the design and performance of existing devices and to develop novel devices for arti?cial vision, arti?cial limbs, and brain-machine interfaces. 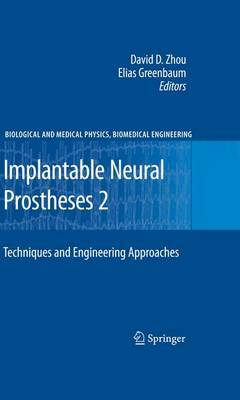 This book, Implantable Neural Prostheses 2: Techniques and Engineering Approaches, is part two of a two-volume sequence that describes state-of-the-art advances in techniques associated with implantable neural prosthetic devices. The techniques covered include biocompatibility and biostability, hermetic packaging, electrochemical techniques for neural stimulation applications, novel electrode materials and testing, thin-?lm ?exible microelectrode arrays, in situ char- terization of microelectrode arrays, chip-size thin-?lm device encapsulation, microchip-embedded capacitors and microelectronics for recording, stimulation, and wireless telemetry. The design process in the development of medical devices is also discussed. Advances in biomedical engineering, microfabrication technology, and neu- science have led to improved medical-device designs and novel functions. However, many challenges remain. This book focuses on the engineering approaches, R&D advances, and technical challenges of medical implants from an engineering p- spective. We are grateful to leading researchers from academic institutes, national laboratories, as well as design engineers and professionals from the medical device industry who have contributed to the book. Part one of this series covers designs of implantable neural prosthetic devices and their clinical applications.